New generation SOA tools such as ESB’s (Enterprise Service Buses), Governance Tools, and Monitoring & Security tools change the integration approach and model. Instead of point to point connections degenerating into interface spaghetti over time, these tools provide centralized facilities for managing and controlling interfaces and inter-system connectivity. They allow you take control of the integration space, manage & control connections, and provide the potential for connection reuse. They also bridge the technology gaps in many a legacy environment between the interface technologies and methodologies of today and those of the past. Using them allows you to move to Centralized Integration Control and Management. This is extremely valuable to any large IT shop in preventing connectivity chaos and integration spaghetti, as well as significantly simplifying and (critical over time) standardizing interface methodology. This is Service Oriented Integration. 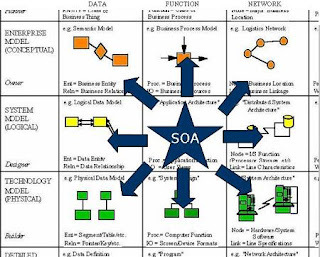 It is not, by itself, Service Oriented Architecture, but a sub-component of the SOA model. It is misrepresented by many a vendor as SOA, and many a vendor Integration tool is labeled today as SOA. Such tools can be a step towards SOA, but usually are just sophisticated integration tools. Nice, but incomplete. Illustration courtesy of Zapthink from "SOA and the Zachman Enterprise Model".